Mary of Magdala is rightfully understood to be the “apostle to the apostles,” the first to proclaim the Good News of Jesus’ Resurrection and a prominent early Christian woman leader whose prophetic proclamations helped foster the Jesus movement and later Christian communities as they emerged in all their diversity. In short, Mary of Magdala preached the Good News. In fact, just last year Pope Francis elevated the liturgical celebration of Mary of Magdala from a “memorial” to a “feast,” citing this woman’s unique role as Apostolorum Apostola. Mary of Magdala, however, is not alone. While certainly unique, she is only one woman in a long line of women who came before and after to preach and proclaim God’s word. In the Hebrew Scriptures, there’s Miriam, prophet and leader among the Israelites (Exodus); Deborah, a judge (a pre-monarchical leader of Israel) and prophet (Judges); and Huldah, a seventh century BCE prophet on whom high priests and royals relied (2 Kings, 2 Chronicles). In the Gospels there is Mary of Nazareth and her Magnificat (Luke); Anna, a prophet who “spoke about the child [Jesus] to all” after Jesus’ presentation in the temple (Luke 2:37); and the Samaritan woman of John’s gospel whose fellow Samaritans “believed in Jesus on the strength of her testimony” (John 4). And of course there are the numerous women named by Paul as leaders and partners in spreading the gospel. Throughout history, countless women have proclaimed the Good News: Catherine of Siena, Hildegard of Bingen, Rose of Viterbo, The Beguines, and Thea Bowman to name just a few. Undoubtedly, women have been preaching the good news of God since the beginning. Yet Catholics rarely hear the stories of these women. It is even less likely that they’re invited to consider them in the preaching ministry of the Church or as preachers. This year’s Mary of Magdala Celebrations—“Go and Tell my Sisters and Brothers: A Celebration of Women Preachers”—sought to change that, lifting up these women and so many more as preachers and proclaimers. Moreover, the celebrations invited participants to take up their own role as preachers and proclaimers. The prayer service began with a Liturgy of the Word—“A Chorus of Voices”—which offered readings from both the Hebrew and Christian Scriptures focusing on women preaching throughout Salvation History, culminating in the Gospel Proclamation of Mary of Magdala’s encounter with the Risen Christ and his commissioning her to “Go and Tell” the apostles. 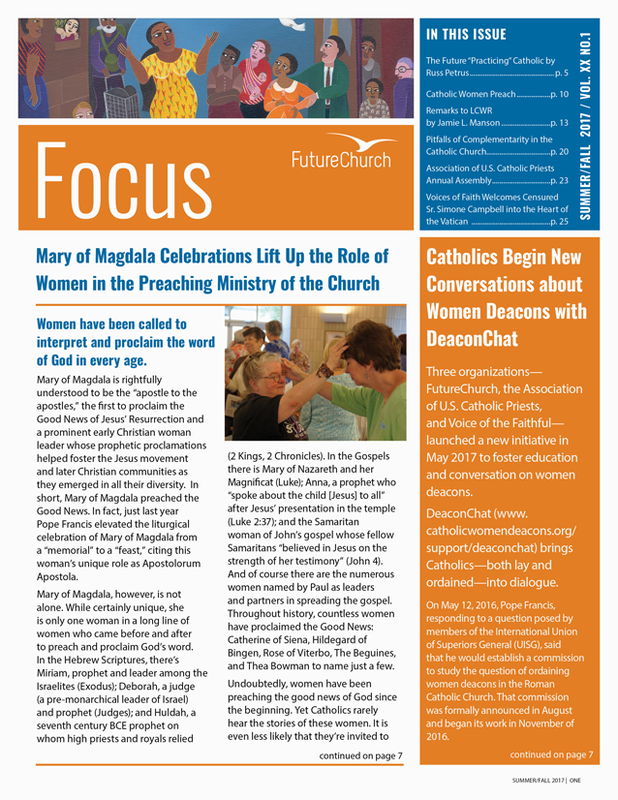 About 250 celebrations on or around Mary of Magdala’s July 22 feast day were planned using FutureChurch resources this year. In the United States, celebrations were held in 32 states and in Washington, D.C. Internationally, there were 34 celebrations in Australia, Canada, England, France, Ireland, Italy, Mexico, New Zealand, and Poland. While most communities used the theme “Go and Tell My Sisters and Brothers: Celebrating Women Preachers,” some communities who were celebrating Mary of Magdala for the first time downloaded older resources as a way of introducing their congregation to the true story of Mary of Magdala.